At the beginning of the U.S. involvement in World War II and immediately after the Japanese attack on Pearl Harbor, fears of a Japanese invasion of the U.S. mainland led to the forcible relocation of Japanese Nationals and U.S. citizens of Japanese descent. People lost their homes and their jobs and were treated as second-citizens. Internees were generally kept here for the duration of World War II. 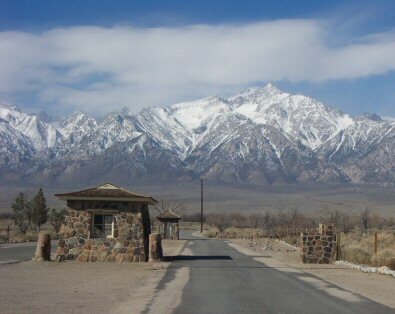 Ten camps were established in the western states, and Manzanar is one of the best-preserved of these. The Site explores this dark time in American history. The camp is located at the base of the impressive Sierra Nevada mountains in east-central California, in Owens Valley. Mt. Whitney, the highest peak in the continental 48 states, is visible to the south. Not much remains of the 800 or so buildings that housed the 11,000 people in Manzanar; however, concrete footings remain, and certain buildings have been or are being restored, including the auditorium, a watch tower, and a mess hall. Manzanar National Historic Site was established only in 1992, and an interpretive center was just opened in 2004 in the restored Manzanar High School auditorium. There is a 3.2 mile driving tour that will take you past sentry posts, the camp auditorium, ruins of the administrative complex, concrete foundations of many types, rocks gardens, portions of the water systems, and the camp cemetery. The Interpretive Center is open from 8:30 to 5:00 until October 31; after that, during the winter months, it will be open from 9:00 to 4:30. The eastern border to Sequoia and Kings Canyon National Parks are just 20 miles to the west, although there's no direct road. There are three high points of this Site: the cemetery, the very impressive visitor center, and the contrast offered by desolate Owens Valley and the sternly beautiful Sierra Nevadas. 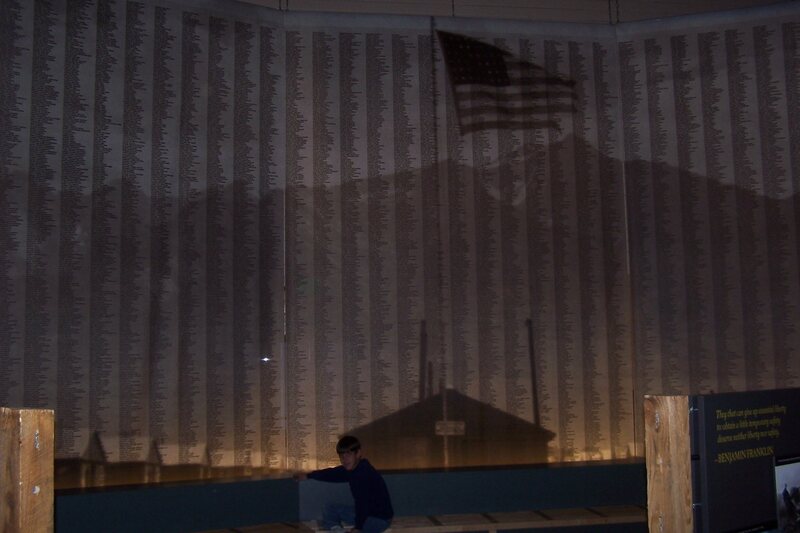 Many internees were here for three years or more, and most of those that died were cremated. A few were buried in a cemetery just outside the walls. A poignant shrine remains; although most families moved their loved ones' remains after the camp closed, six are still are here, and the gravesites are kept up and honored today. The words on the front of the obelisk can be translated as "soul consoling tower". 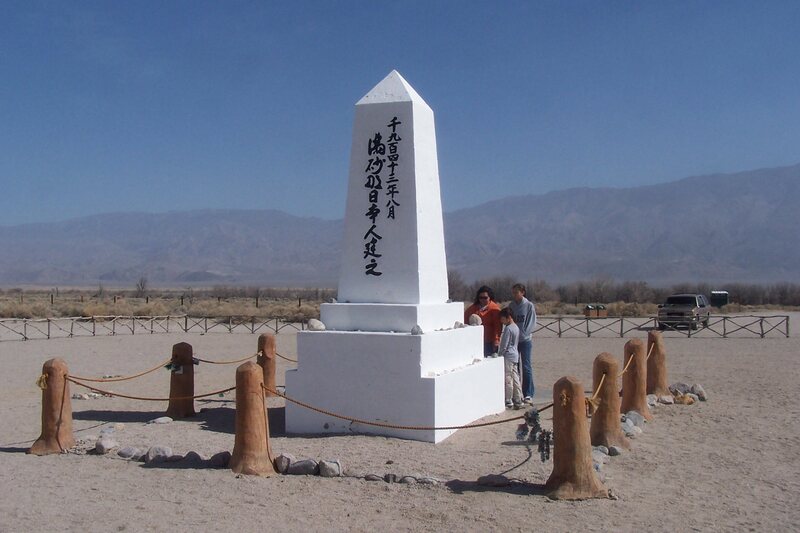 The writing on the back reads "August 1942" and "erected by the Manzanar Japanese". There is very little left of the Manzanar that existed from 1942 to 1945, so don't expect to see the buildings. All I noticed were these -- a (reconstructed) guard tower, the cemetery, two small checkpoint buildings as we drove in, and the high school auditorium, now serving as the visitor center. Everything else is gone -- all the barracks, the mess halls, the dojo, the police station and newspaper office and Catholic and Buddhist churches, everything. All that remains to mark their location are some concrete slabs; the gardens and orchards have reverted to the wild. But the high school auditorium remains, and this is the best part of Manzanar. The National Park Service has set up exhibits that rival those of National Parks here, and it does credit to those who were interned 60 years ago. There are stories highlighting the racism that existed then, the racism and fear that allowed camps like Manzanar to exist. There are stories of internees who persevered despite the humiliation and the terrible living conditions. Some made excellent furniture from scrap wood, some smuggled items in that made camp life more bearable. Many simply existed, raising their families as best they could while maintaining a semblance of normal life. The NPS, and those who helped establish this Site, are to be commended for the good job done at the visitor center. The final image that struck me was the location of the camp. 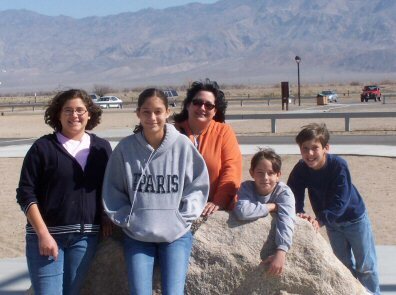 Owens Valley isn't a terrible place to live, but it isn't paradise either. When we were there a constant wind blew dust in our face. The Sierras clearly cast a rain shadow, and the plants that grew seemed fit more for a desert than anything else. Then, lifting our eyes to the east, we see the Sierra Nevadas -- sharp, blue, imposing, dramatic. What a view for the people imprisoned here! I wonder what they thought, if and when they thought of those mountains past the barbed wire fence. Be prepared for strong winds and blowing dust any time of year, and wear sturdy walking shoes if you're going to take an hour or two to examine the Site on foot. The visitor center offers a pamphlet for a guided walking or driving tour; I recommend it. Your family would learn a lot. Ours did, even if, after we were joking around about the meaning of Manzanar, Lucas piped up: "Wait, there's going to be a quiz? Because I wasn't really paying attention." A note about the rating: The Site itself deserves one subbie, maybe two. But the wonderful visitor center, and the dramatic setting by the Sierras, lift it nearly to three. Nearly. From Bakersfield, go east on highway 58 about 40 miles to Mohave and the intersection with highway 14. Take that north 114 miles to Lone Pine. 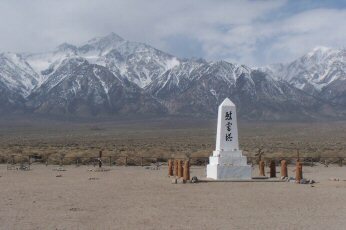 Manzanar is about ten miles further north, on the west. Death Valley National Park is 30 miles to the east. As mentioned, Sequoia National Park and Kings Canyon National Park are directly to the west. Yosemite National Park and Devils Postpile National Monument are 80 or so miles to the north.